In today's discussion we will see how to return a XML response from a Spring MVC Controller. @ResponseBody annotation does this job done for us, all we need to do is adding @ResponseBody annotation in front of controller and annotate the object we want to return in xml form. Let's see the functioning of @ResponseBody annotation and how it helps in returning an java object in XML form. This is a simple Java class (Student) whose object will be returned in xml form, from the controller. 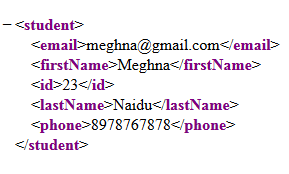 @XmlRootElement defines the root element of xml structure, by default it takes class name as root element. Optionally we can give it s "name" parameter if we want some other name as xm root element. 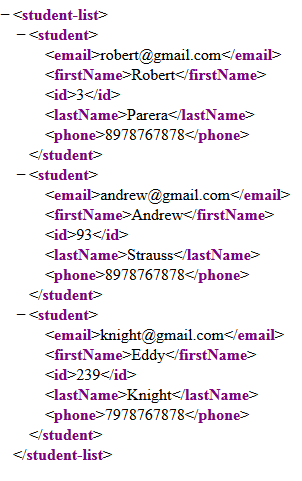 @XmlElement defines internal xml nodes, 'name' attribute applies here as well, as same as with @XmlRootElement. We just saw how to return an java object in xml form, that was quit simple because we have full control to 'Student' class and hence we could annotate the class easily. In case we want to return a list of objects say 'ArrayList', but we dont have ArrayList class's code to annotate it. So its a bit tricky; we have to make an other class having a list of objects and the object of that annotated class will represent the whole list and will be returned as a list of xml nodes. That's all we need to know about @ResponseBody annotation and how to return xml response from Spring Controller. Lets now add all other useful files to our project to make it working. 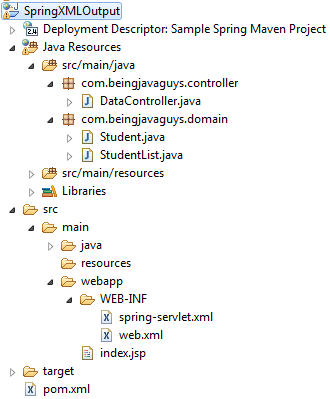 Dependencies required to return xml response from Spring Controller. In upcoming blogs we will see more about Spring, Hibernate, Java and Other opensource technologies.